Hello Friends & Nutrition Colleagues! It’s been a while since I have been in touch. This summer we had some devastating wild fires in our area of Colorado. The fire came within 30 feet of our home so we were extremely lucky. There are bittersweet feelings. While we were spared, the neighborhood next to ours was completely devastated. I continue to pray and send positive energy to those who lost so much. While I was gone for several weeks in the summer, I was still able to hit the farmer’s markets here in the Springs! This summer I found a great soy-free egg hook-up. I have to get there early, as she runs out fast. I am able to buy from her outside the farmer’s market so that is sweet! I have kept boiled eggs in the fridge all summer long for the kid’s breakfast. That system seemed to work well for us as we frequently got up at different times in the morning. It was nice to know that they could peel an egg and have that burst of protein right away in the morning! I hope you are continuing to improve your health and find ways to nourish your body! I have chatted with numerous friends throughout the summer that recently gave up gluten. Gluten is a protein found in wheat. As we get older, some of us find it harder to digest this protein. Some people have a very obvious reaction to gluten which include: rashes, hives, itching, congestion, diarrhea, vomiting. Others may have more subtle signs such as fatigue, bloating, headaches, mood swings, muscle pain, constipation and dark circles under the eyes. If you truly do have an allergy or sensitivity to wheat, the constant irritation from the exposure to wheat will create inflammation to the entire digestive system. The digestive tract is a delicate and intricate part of your immune system. Irritation and inflammation can cause a breakdown in your immune system which can possibly manifest in an autoimmune disorder or other chronic disease. If you think you might have an allergy/sensitivity to gluten, try cutting wheat from your diet for two weeks. Pay attention to how you feel once you eliminate gluten from your diet. You may surprise yourself! I hope you enjoy this recipe. I am currently working on a protein bar treat. My co-workers have been my guinea pigs and I am almost there! Peace, love and healthy eating till we connect again! Continue to create positive thoughts with good intentions! 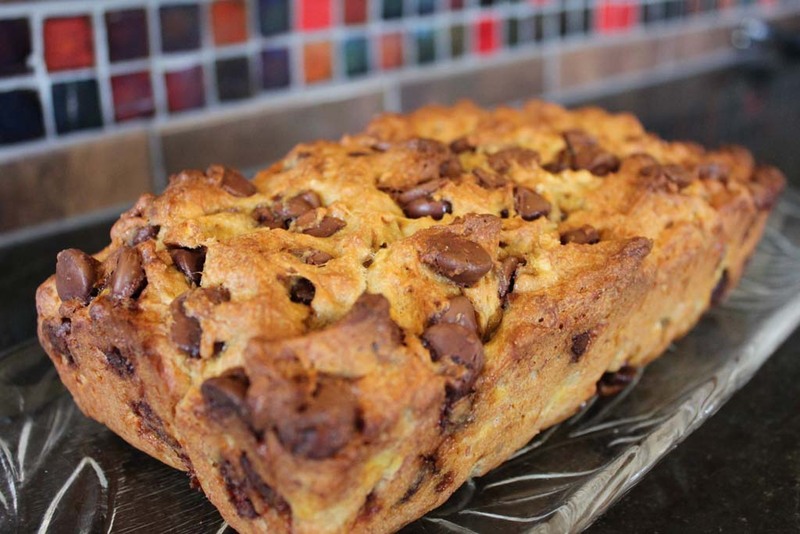 This entry was posted in Delicious Recipes and tagged banana bread, gluten free chocolate chip banana bread, gluten free recipe. Bookmark the permalink. Thank you for your thoughtful and inspirational posts to help motivate me in my kitchen and in my life. Our family is looking forward to the protein bar recipe as soon as it is ready. The early samples have been super tasty!